I usually don’t go in for guidebooks, handbooks, “secret files,” or whatever you want to call them. I enjoyed the 1980's Official Handbook of the Marvel Universe when they first came out, but have since regretted the fact that the things ever saw the light of day. I think the idea of cataloguing the specifics of super-heroes and super-villains has led to an RPG-mentality among comics readers (evidenced by the ka-zillion message board posts across the net devoted to answering the all-important question of whether or not Drax-with-a-power-gem can defeat Thanos-with-a-kazoo) that judges comics not by artistic or storytelling ability, but by whether or not Spider-Man should have been allowed to beat up Firelord. And the Marvel handbooks of recent years haven’t even had the advantage of being pleasing to the eye. While the old OHOTMU featured numerous panels borrowed from comics in which the profiled characters appeared, such snapshots have been rare in the more recent volumes, and usually they’re poorly cropped and only included to fill space. 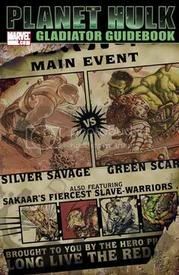 Planet Hulk: Gladiator Guidebook is a cut above the rest, and the reason is that the goal isn’t to chronicle the events any reader could find just by reading the comics on which the guidebook is based, or the cataloguing of power limits. True to its name, PH: GG pretends to be an annual guidebook for audiences of Sakaar’s gladiator games. The guidebooks gives readers a surprisingly intricate history of Sakaar, its people, its geography, its wildlife, and the surrounding star system. A prime example of the guide’s thoroughness is an entire page dedicated to Ronan Kaifi, a character who lived and died in about two or three panels of Hulk #93. It includes three beautiful double-page maps – drawn by Jim Calafiore*** – of the Tayo Star System, Sakaar, and the Crown City. It’s a testament to how far Pak and co. went to create a believable and engaging setting for “Planet Hulk,” and it also provides ammunition for my desire for the green guy to NOT return to Earth for vengeance after the conclusion of “Planet Hulk,” but to remain among the stars and have more epic adventures. I even found myself thinking, while reading about specific historical events or characters, that those stories on their own could become cool mini-series. ***While I can’t provide a link to confirm this, I believe I recall an interview in which Calafiore claimed the Hulk was one of his favorite subjects to draw. I don’t think he’s ever been a regular Hulk artist, but he did a wonderful job drawing the character for guest appearances in Black Panther and Exiles (and perhaps others I don’t know about). The history that Flamini and Pak outline is both believable and interesting, as are the scientific explanations for much of the technology, physiology, etc. (of course, this is coming from someone who knows as much about science as Jerry Bruckheimer knows about subtlety). At 48 pages, PH: GG includes a hell of a lot more extra info than I was expecting, and the info proved engaging enough that I read it all the way through without a break, despite the two tpbs I had bought and was waiting to crack open (Rocketo and Silent Dragon, for anyone who cares). For the first time since I started reviewing parts of “Planet Hulk,” I do have to admit to some disappointments, though most of my complaints have to do with the formatting of the book rather than information contained within. For example, while the aforementioned double-page maps already put PH: GG a few notches above any of Marvel’s recent handbooks as far as new art is concerned, most of the art is pulled directly from “Planet Hulk” issues (I only spotted one piece that may be new or may be from a future issue – a pic of the Death’s Heads fighting the Devil Corkers on pg. 27). Of course, this is to be expected and usually isn’t a problem, but it’s regrettable that more new pictures couldn’t have been commissioned, particularly for the “Wildlife” and “Wildebot” sections. There a number of pictures in the “Wildlife” section where you really have to squint to even figure out where the wildlife in question is hiding, and the pic included in the “Wildebot” section features the Imperials running from the wildebot more prominently than the wildebot itself. It may just be that my eyesight is failing and I need some glasses, but the white lettering on the black background gave me some trouble. Also, the font size changes often to suit the formatting, and in particular a lot of the profiles for the warbound gladiators got really, really tiny. I was blinking and rubbing my eyes a lot while reading PH: GG. This isn’t so much a complaint, but I think it would’ve been cool if the formatting of PH: GG more strongly suggested the idea that it was something produced on Sakaar rather than a handbook for comics readers. Admittedly, this might have been difficult, particularly when trying to keep the cost of the book reasonable. The only really successful example of something like this I’ve seen is the Astro City Visitor’s Guide that came out right before Astro City: The Dark Age. As far as the information contained within PH: GG, most of it is consistent, but there is one itty, bitty thing that’s been bugging me. “Planet Hulk,” we find out in the intro of the guidebook, is set in the Sakaarian year 566 Post. The guidebook stays true to the idea that the time between the creation of the Fantastic Four to today equals about 10 “Earth” years. In Hulk’s profile, for example, it says that Bruce Banner became the Hulk 10 Earth years ago. Likewise, in Korg’s profile, it says he fought Thor 10 Earth years ago. But, using the Sakaarian designation for years, Korg’s profile says he landed on Sakaar in 464 Post. Since “Planet Hulk” begins in 566 Post, that means either A) Earth years are 10 times as long as Sakaarian years or, B) going through the Great Portal causes some kind of time shift or, C) someone made a boo-boo. If the answer is A, then it might have been a good idea to work in an explanation of the difference between Earth and Sakaarian years. If the answer is B, then that opens up some interesting possibilities concerning if/when Hulk returns to Earth. If the answer is C, then, whoops. In spite of its faults, Planet Hulk: Gladiator Guidebook is certainly one of the best handbooks this Hulkling has come across. It lives up to Anthony Flamini’s comparsion – made during a brief interview in Giant-Size Hulk #1 – to the appendices found at the end of The Lord of the Rings. The info contained isn’t essential to understand or enjoy “Planet Hulk,” but it adds a historical flavor to the epic that will make it that much harder to say goodbye when it concludes next year. Go US Mail System! Go!